Seaway Valley Crime Stoppers and the SD&G OPP are asking for information about a theft in South Glengarry. In the previous two (2) weeks, a “Case” tractor with an older model Bush Hog attachment was stolen from a property on Concession 8, South Glengarry Township. Seaway Valley Crime Stoppers and the SD&G OPP are asking for information about a trailer theft in North Stormont. 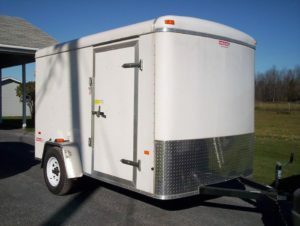 On March 31, 2017 – between 11:00am and 3:00pm, a white 2011 “Haulin” enclosed utility cargo trailer (6″x10″) was stolen from a property on Gravel Hill Road, North Stormont Township. The unit is a single axle with white rims, side access door and rear barn-style doors. During the day of February 28, 2017 (11:30am – 6:00pm), a white 2012 Dodge Ram pick-up truck (“Evergreen” logo on back window, broken rear window and damage to rear bumper) and equipment was stolen from a property on Flagg Road, South Dundas Township. On January 13, 2017 at approximately 10:55pm, Stormont, Dundas & Glengarry (SD&G) Ontario Provincial Police (OPP) officers, with the assistance of OPP Emergency Response Team (ERT) and OPP K-9 members responded to a report of an armed robbery at a business (Mac’s Milk) on Plaza Drive in the Village of Iroquois, South Dundas Township. Male: white, approximately 25 years, 5’5”, slim build wearing a black toque and black t-shirt with a logo.